^ "public transport". English Oxford Living Dictionaries. Oxford University Press. Retrieved 30 January 2018. Buses, trains, and other forms of transport that are available to the public, charge set fares, and run on fixed routes. ^ Joseph L. Schofer. "Mass transit". Encyclopædia Britannica. Encyclopædia Britannica. Retrieved 30 January 2018. 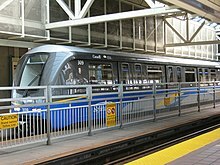 Mass transit, also called mass transportation, or public transportation, the movement of people within urban areas using group travel technologies such as buses and trains. ^ Young, Jay (2 March 2015). "Infrastructure: Mass Transit in 19th- and 20th-Century Urban America". Oxford Research Encyclopedia of American History. 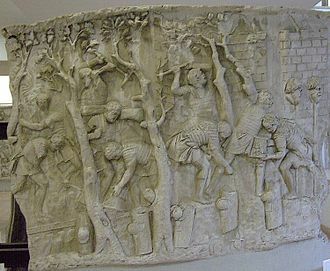 doi:10.1093/acrefore/9780199329175.001.0001 (inactive 5 February 2019). Retrieved 28 November 2018. ^ Andrew Gilligan. "Running out of road". National Infrastructure Commission. National Infrastructure Commission. Retrieved 30 January 2018. cycling is mass transit and must be treated as such. ^ "Microsoft Word – 5_10-Air" (PDF). Retrieved 29 October 2012. ^ "Transportation Invest In Our Future – Surface Transportation Policy Recommendations". Transportation1.org. Archived from the original on 10 March 2013. Retrieved 21 October 2011. ^ "Page Not Found » Search » Washington Policy Center". 13 March 2016. Archived from the original on 13 March 2016. ^ "UITP Advocacy". Uitp.org. Archived from the original on 10 March 2012. Retrieved 21 October 2011. 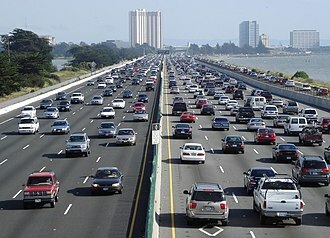 Human-powered transport is the transport of person and/or goods using human muscle power. Like animal-powered transport, human-powered transport has existed since time immemorial in the form of walking and swimming, modern technology has allowed machines to enhance human-power. Although motorization has increased speed and load capacity, many forms of human-powered transport remain popular for reasons of lower cost, physical exercise, human-powered transport is sometimes the only type available, especially in underdeveloped or inaccessible regions. In the 1989 Race Across America, one used a experimental device comprising a rear wheel hub, a sensor. The most efficient human-powered land vehicle is the bicycle, compared to the much more common upright bicycle, the recumbent bicycle may be faster on level ground or down hills due to better aerodynamics while having similar power transfer efficiency. Velomobiles are increasingly popular in colder and/or wetter countries due to the protection they offer against the environment, freight bicycles are used to transport cargo. Cycle rickshaws can be used as taxicabs, in 2016, AeroVelo cyclist Todd Reichert achieved the human-powered speed record of 142.04 km/h with a velomobile at Battle Mountain, Nevada. Dutch cyclist Fred Rompelberg set a 268.8 km/h speed record at the Bonneville Salt Flats in Utah on October 3,1995 while cycling in the wake of a motor dragster pace-car, the wake of the pace-car reduced the aerodynamic drag against which Rompelberg pedalled to almost zero. Greg Kolodziejzyk set two world records recognized by both the International Human Powered Vehicle Association and Guinness World Records on July 17,2006 on a track in Eureka. The first record is for the most distance traveled in 24 hours by human power 1,041 km, and the second for the worlds fastest 1,000 km time trial. 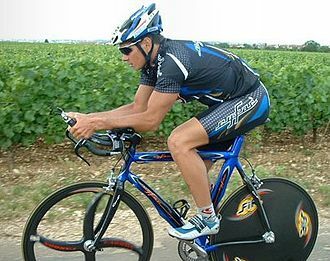 Both records were broken on August 6,2010 by Christian von Ascheberg who drove 1,000 km in 19 hours,27 minutes, in the same race he raised the 12-hour record to 664.97 km, which is an average of 55.41 km/h. In 1969, artists in a small Northern California town began the Kinetic sculpture race which has grown to a 42 mi, three-day all terrain, human-powered sculpture race and it is held every year on the last weekend in May. A trolleybus is an electric bus that draws power from overhead wires using spring-loaded trolley poles. 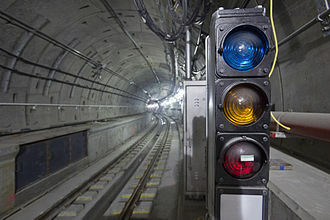 Two wires and poles are required to complete the electrical circuit and this differs from a tram or streetcar, which normally uses the track as the return path, needing only one wire and one pole. They are distinct from other kinds of buses, which usually rely on batteries. 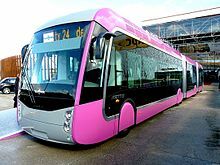 Power is most commonly supplied as 600-volt direct current, but there have been, around 300 trolleybus systems are in operation, in cities and towns in 43 countries. Altogether, more than 800 trolleybus systems have existed, but not more than about 400 concurrently, the trolleybus dates back to 29 April 1882, when Dr. Ernst Werner Siemens demonstrated his Elektromote in a Berlin suburb. This experiment continued until 13 June 1882, after there were few developments in Europe. In 1899, another vehicle which could run either on or off rails was demonstrated in Berlin, routes followed in Eberswalde and Fontainebleau. Max Schiemann on 10 July 1901 opened the worlds fourth passenger-carrying trolleybus system, although this system operated only until 1904, Schiemann had developed what is now the standard trolleybus current collection system. In the early days there were a few methods of current collection. 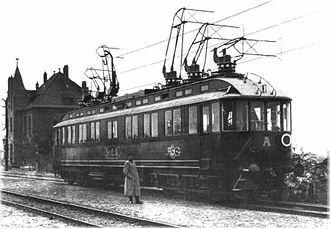 The Cédès-Stoll system was operated near Dresden between 1902 and 1904, and in Vienna, the Lloyd-Köhler or Bremen system was tried out in Bremen, and the Cantono Frigerio system was demonstrated near Milan. Throughout the period, trackless freight systems and electric canal boats were built and Bradford became the first cities to put trolleybuses into service in Great Britain on 20 June 1911. Apparently, though it was opened on 20 June, the public was not admitted to the Bradford route until the 24th, Bradford was the last to operate trolleybuses in the UK, the system closing on 26 March 1972. The last rear-entrance trolleybus in Britain was in Bradford and is now owned by the Bradford Trolleybus Association, birmingham was the first to replace a tram route with trolleybuses, while Wolverhampton, under the direction of Charles Owen Silvers, became world-famous for its trolleybus designs. There were 50 trolleybus systems in the UK, Londons being the largest, by the time trolleybuses arrived in Britain in 1911, the Schiemann system was well established and was the most common, although the Cédès-Stoll system was tried in West Ham and in Keighley. Paratransit services may vary considerably on the degree of flexibility they provide their customers. At their simplest they may consist of a taxi or small bus that will run along a more or less defined route, in addition to public transit agencies, Paratransit services are operated by community groups or not-for-profit organizations, and for-profit private companies or operators. Typically, minibuses are used to provide paratransit service, most paratransit vehicles are equipped with wheelchair lifts or ramps to facilitate access. 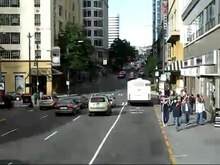 In the United States, private companies often provide paratransit service in cities. Veolia Transport, First Transit and MV Transportation are among the largest private contractors of paratransit services in the United States, any type of public transportation that is distinct from conventional transit, such as flexibly scheduled and routed services such as airport limousines, etc. Etymology, para- alongside of + transit The use of paratransit has evolved and these are still extremely important in many parts of the world. Paratransit is a mode of flexible passenger transportation that does not follow fixed routes or schedules. Since the early 1980s, particularly in North America, the term began to be used increasingly to describe the second meaning, in this respect, paratransit has become a subsector and business in its own right. The term paratransit is rarely used outside of North America, Section 504 prohibited the exclusion of the disabled from any program or activity receiving federal financial assistance. Most transit agencies did not see fixed route accessibility as desirable and opted for a system of small paratransit vehicles operating parallel to a system of larger. With the passage of the ADA, Section 504 of the Rehabilitation Act was extended to all activities of state. Its provisions were not limited to programs receiving federal funds and applied to all public transit services, Title II of the ADA more clearly defined a disabled persons right to equal participation in transit programs, and the providers responsibility to make that participation possible. A cable car is any of a variety of cable transportation systems relying on cables to pull vehicles along or lower them at a steady rate. 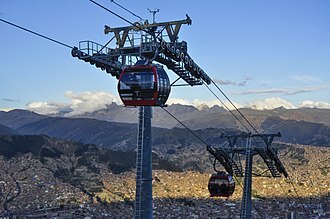 The terminology refers to the vehicles on these systems, the cable car vehicles are motorless and engineless and they are pulled by a cable that is rotated by a motor off-board. 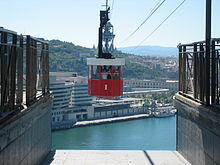 Cable car transport systems are a transportation system for various situations. Cable-Propelled Transit can be effective as a transit system at a reasonable cost. 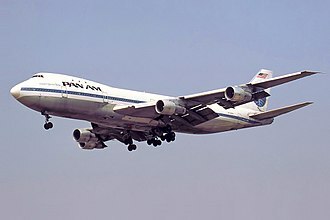 They are advantageous for transit of mountains, steep slopes and bodies of water, in an aerial transit system, cabins are suspended and propelled from above by cables. 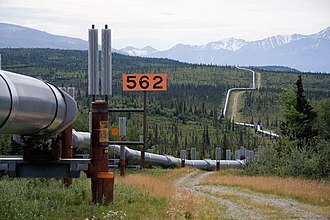 The cable that supports the cabin may or may not be the one that propels it too and this depends on the technology used. It is a two way transport, a mono-cable detachable system has only one cable that does the work of supporting and propelling. 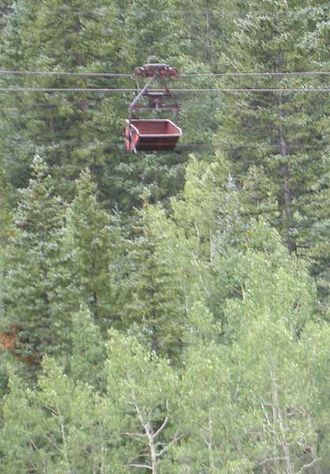 A bi-cable detachable gondola has two cables, one of which supports the cabin and this cable is stationary while the other cable moves and serves the purpose of propulsion. 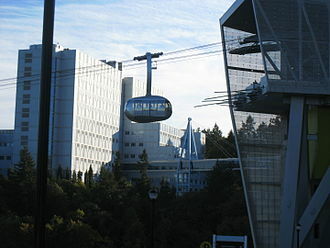 An aerial tramway consists of a suspended from a cable. 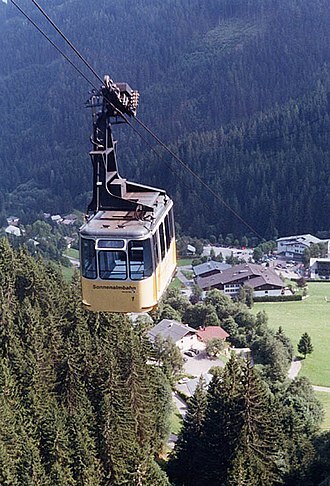 A tri-cable detachable gondola has three cables, two of which help in supporting and the other in propelling the cabin, a funifor is a type of aerial lift or aerial tramway patented by Doppelmayr Garaventa Group which consists of two guide ropes and a haul rope loop per cabin. The drives of the two cabins are not interconnected with two reversible cabins running on parallel tracks. 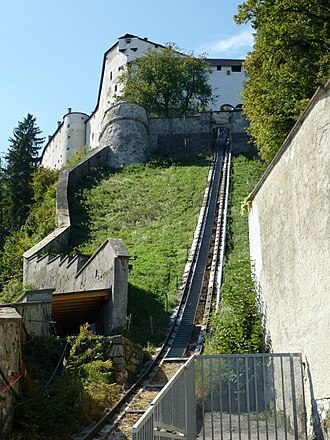 At the top of each track, the rope for that track loops back to the bottom instead of looping over to serve the other track as occurs with a normal aerial tramway. In other words, a propulsion is not returned to the opposite direction for use by the other vehicle. 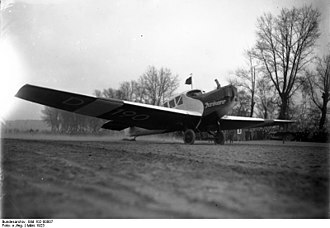 A funitel is a type of lift, generally used to transport skiers. The name funitel is a portmanteau between the French words funiculaire and telepherique, funitels have not only been used as a means to transport skiers, there is one used to transport finished cars between different areas of a factory. Trolza, formerly known as the Uritsky factory or simply Uritsky, is a trolleybus manufacturer in Russia, located in Engels, Saratov oblast. 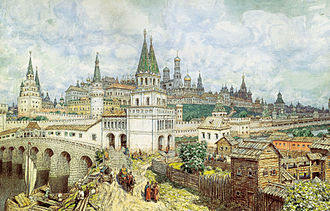 In the Soviet era it was known as ZiU or Uritsky factory, the enterprise was founded in Imperial Russia in 1868, but it began producing trolleybuses in 1951. For many years until at least the early 1990s, ZiU was the worlds largest manufacturer of trolleybuses, around 1996, it was renamed Trolza, short for AO Trolleybusnyi Zavod. ZiU/Trolza has built over 65,000 trolleybuses and continues this business now, the most numerous models of ZiU production were the MTB-82, the ZiU-5, both now discontinued, and the ZiU-9. All of them were exported to different countries of the world, including Argentina, Greece, Hungary, Serbia etc. In the 1980s, ZiU was building more than 2,000 trolleybuses per year, mostly for domestic use, in 2016, Trolza announced that it would begin production of trolleybuses and electric buses in Juárez Celman, Córdoba Province, Argentina. In addition to describing a particular form of urbanization, the term relates to the social and environmental consequences associated with this development. 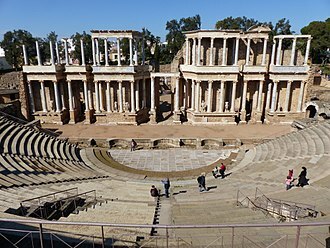 In Continental Europe the term peri-urbanisation is often used to denote similar dynamics and phenomena, There is widespread disagreement about what constitutes sprawl and how to quantify it. For example, some commentators measure sprawl only with the number of residential units per acre in a given area. But others associate it with decentralization, segregation of uses, the term urban sprawl is highly politicized, and almost always has negative connotations. It is criticized for causing environmental degradation, and intensifying segregation and undermining the vitality of existing urban areas, due to the pejorative meaning of the term, few openly support urban sprawl as such. 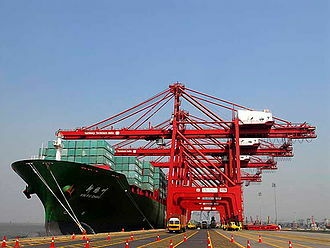 The term has become a cry for managing urban growth. Definitions of sprawl vary, researchers in the field acknowledge that the term lacks precision and he argued that a better way to identify sprawl was to use indicators rather than characteristics because this was a more flexible and less arbitrary method. He proposed using accessibility and functional space as indicators. 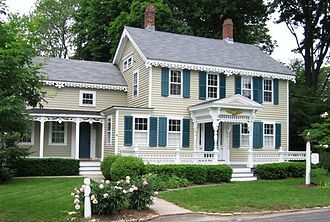 Ewings approach has been criticized for assuming that sprawl is defined by negative characteristics, what constitutes sprawl may be considered a matter of degree and will always be somewhat subjective under many definitions of the term. The following characteristics are associated with sprawl, This refers to a situation where commercial, residential and industrial areas are separated from one another. Consequently, large tracts of land are devoted to a use and are segregated from one another by open space, infrastructure. The degree to which different land uses are mixed together is used as an indicator of sprawl in studies of the subject. 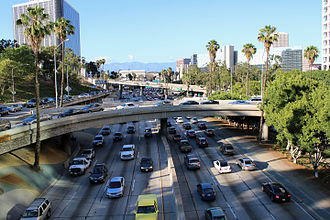 Job sprawl is another land use symptom of urban sprawl and car-dependent communities, spatial mismatch is related to job sprawl and economic environmental justice. Job sprawl has been documented and measured in various ways and it has been shown to be a growing trend in Americas metropolitan areas. Inter-city rail services are express passenger train services that cover longer distances than commuter or regional trains. There is no definition of inter-city rail, its meaning may vary from country to country. 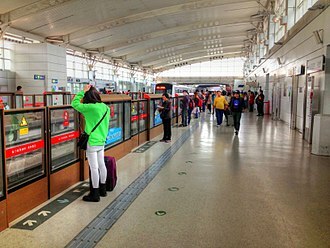 Most typically, an inter-city train is a train with limited stops. Inter-city rail sometimes provides international services and this is most prevalent in Europe, due to the close proximity of its 50 countries in a 10,180,000 square kilometre area. 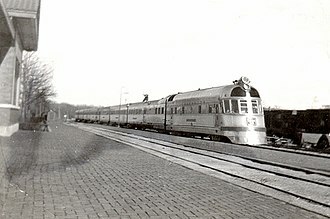 Eurostar and EuroCity are examples of this and this use of the term appeared in the United Kingdom in the 1960s and has been widely imitated. The speeds of inter-city rail lines are diverse, ranging from 50 km/h in a mountainous area or on undeveloped tracks to 200–350 km/h on newly constructed or improved tracks. As a result, Inter-city rail may or may not fall into the category of higher-speed rail or high-speed rail, the average speed of inter-city rail service would be faster than 100 km/h in order to be competitive with car and other methods of transport. 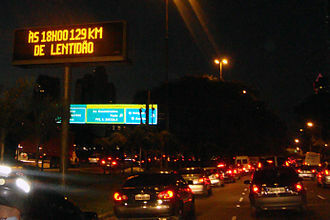 50–100 km The distance of an inter-city rail journey is usually at least 50–100 km, although in large metropolitan areas commuter. 100–500 km A distance of 100–500 km is a common journey distance for inter-city rail in many countries, in many cases, railway travel is most competitive at about 2–3 hours journey time. Inter-city rail can compete with highways and short-haul air travel for journeys of this distance. 500–1,000 km In journeys of 500–1,000 km, development of high-speed rail in some countries increases the share of railway for such longer-distance journeys. The Paris-Marseille TGV and Tokyo-Aomori Shinkansen are examples of type of journey. 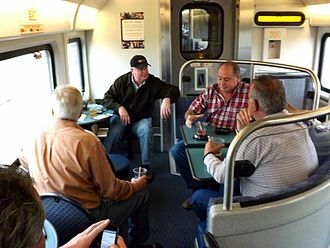 In conventional non high-speed rail, overnight trains are common for this distance, in many other countries, such long-distance rail journey has been replaced by air travel except for tourism or hobbyist purposes, luxury train journeys, or significant cost benefit. Discount Eurail Pass in Europe, Amtrak in the United States, New high-speed lines from 200–350 km/h operation are constructed, and many conventional lines are upgraded to 200 km/h operation. 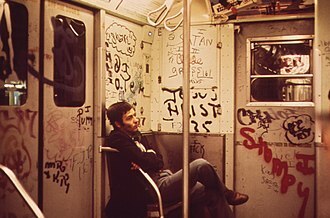 Opened in 1904, the New York City Subway is one of the worlds oldest public transit systems, one of the worlds most used metro systems, and the metro system with the most stations. 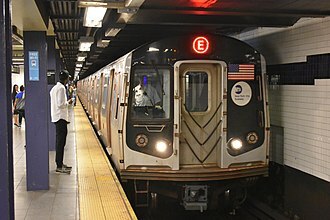 It offers service 24 hours per day, every day of the year, the New York City Subway is the largest rapid transit system in the world by number of stations, with 472 stations in operation. 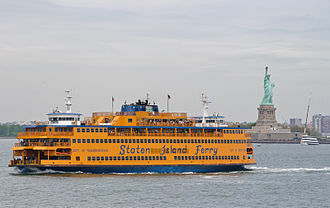 Stations are located throughout the boroughs of Manhattan, Queens, the Port Authority Trans-Hudson and the AirTrain JFK, in Manhattan and Queens respectively, accept the subways MetroCard but are not operated by the MTA and do not allow free transfers. Another mass transit service that is not operated by the MTA, the system is one of the worlds longest. Overall, the system contains 236 miles of routes, translating into 665 miles of track. In 2015, the subway delivered over 1.76 billion rides, averaging approximately 5.7 million daily rides on weekdays and a combined 5.9 million rides each weekend. Of the systems 25 services,22 of them pass through Manhattan, the exceptions being the G train, the Franklin Avenue Shuttle, and the Rockaway Park Shuttle. Large portions of the subway outside Manhattan are elevated, on embankments, or in open cuts, in total, 40% of track is not underground despite the subway moniker. Many lines and stations have both express and local services and these lines have three or four tracks. 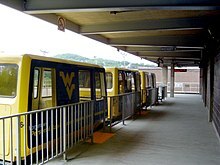 Normally, the two are used for local trains, while the inner one or two are used for express trains. Stations served by express trains are typically major transfer points or destinations, alfred Ely Beach built the first demonstration for an underground transit system in New York City in 1869 and opened it in February 1870. The tunnel was never extended for political and financial reasons, although extensions had been planned to take the tunnel southward to The Battery, the Great Blizzard of 1888 helped demonstrate the benefits of an underground transportation system. 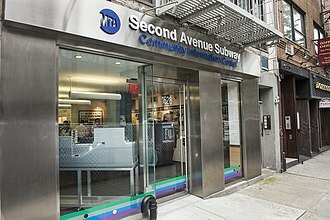 A plan for the construction of the subway was approved in 1894, the first underground line of the subway opened on October 27,1904, almost 36 years after the opening of the first elevated line in New York City, which became the IRT Ninth Avenue Line. 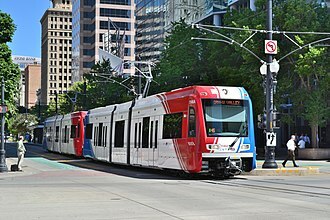 Utah Transit Authority's TRAX is one of the fastest-growing light rail systems in the United States. An integral bodywork MCI 102DL3, the most common intercity bus owned by Greyhound Lines, the largest provider of intercity bus service in North America. Greyhound no longer operates the 102DL3 in this configuration. Behind time, anonymous engraving of a stagecoach in England. The Hyde Park Gate in London, erected by the Kensington Turnpike Trust. These trusts helped to stimulate a sustained period of road improvement in the 18th century. Pilots of 611 West Lancashire Squadron lend a hand pushing an early Spitfire Mark IXb, Biggin Hill, late 1942.